Chevron Nigeria Limited (CNL) has signed a deal to supply natural gas to the fertiliser plant of Dangote Fertilizer Limited. The factory is expected to begin operations soon and as part of efforts to enable smooth services, the management of Dangote Fertilizer Limited entered into a long-term supply agreement with Chevron Nigeria Limited (CNL). The factory will produce 3.0 million metric tonnes per annum (mmtpa) of Urea and consists of twin train, with each single train having a capacity of 1.5 million tonnes per annum of Urea and Ammonia, which makes each of them the largest train available in the world. Hence the total capacity of the plant is 3 million tonnes per annum, and it sits on an area of 500 hectares. The contract, under the Gas Sale and Aggregation Agreement (GSAA) is part of International Oil Company (IOC)’s gas obligation to the domestic market through the Gas Aggregation Company Limited (GACN). The signing ceremony, held at the Department of Petroleum Resources (DPR) office in Lagos, was executed on behalf of the parties by Group Executive Director, Strategy, Capital Projects & Portfolio Development, Dangote Industries Limited, Devakumar Edwin; Chairman/Managing Director, Chevron Nigeria Limited (CNL), Jeffrey Ewing; Head, Gas Monitoring & Regulation Division, Department of Petroleum Resources (DPR), Sanya Bajomo; and Managing Director/CEO, Gas Aggregation Company Nigeria Limited (GACN), Engr. Morgan Okwoche. 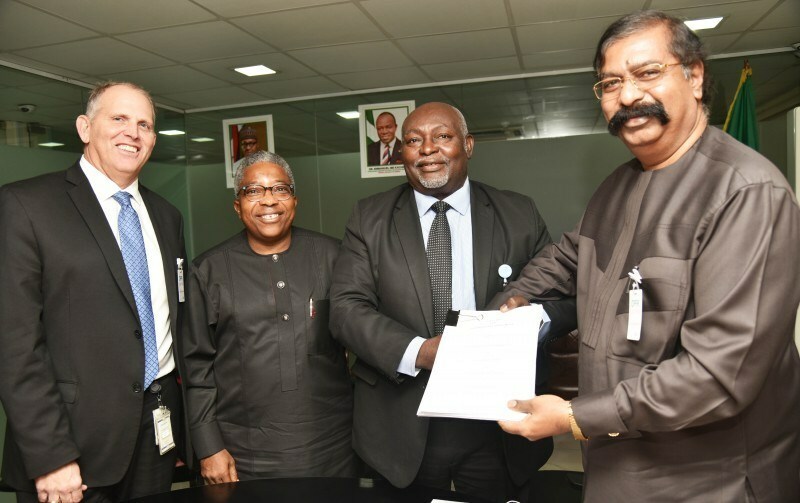 Speaking at the signing ceremony, Group Executive Director, Strategy, Capital Projects & Portfolio Development, DIL, Devakumar Edwin, commended the Managing Director of GACN for his role in the new business relationship between Dangote Fertilizer Limited and Chevron Nigeria Limited. He said the company is looking forward to having a long-term relationship with Chevron Nigeria Limited as well as synergies in other upstream and wider areas of operations in the oil and gas sector. Managing Director/CEO of GACN, Morgan Okwoche, expressed delight to be part of the domestic gas agreement, describing it as “the beginning of fruitful relationship between Dangote Fertilizer Limited, Chevron Nigeria Limited and other parties. Head, Gas Monitoring & Regulation Division, DPR, Sanya Bajomo, said: “I am glad that GACN, Chevron and Dangote have signed this gas supply agreement.